On August 20, 1994, Casey Kammel and his girlfriend, Lisa, were having a great time hanging out at a resort in Maui. Casey, a personal trainer, dove into the pool headfirst. He heard a massive crunching sound. He opened his eyes and thought, ‘Okay, swim.’ His body did not respond. Lisa saw his head was bleeding and pulled him to the surface. She asked, “What’s wrong? What’s wrong?” “I can’t move,” he replied. “What do you mean you can’t move?” she asked. “I can’t feel my body. I can’t feel my arms and legs. I can’t move,” Casey answered. Lisa screamed for help. And with uncanny timing, she got it. A man jumped into the pool. “Don’t worry. I’m a neurosurgeon,” he calmly explained, “Yeah, he probably has a spinal cord injury. Don’t move his head. Don’t move his neck. Just keep him floating in the pool.” The good-Samaritan doctor and Lisa held Casey in the water. When the paramedics arrived, they floated a backboard underneath Casey, strapped him in, and carefully lifted him out of the water. Then he was transported by helicopter from Maui to a hospital in Oahu. The doctors waited a week for the swelling to go down before they performed surgery. Since he fractured C4 vertebrae, they fused his C3, C4, and C5 together. 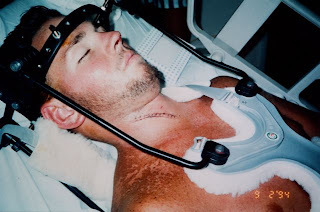 They also bolted a steel halo brace to his head to prevent his neck from being moved while his body healed. He remained in the hospital for three weeks. While he doesn’t remember a lot about that time because of the strong drugs, he does recall being able to faintly move his left leg, right thumb and right toe. The doctors had him transferred to Long Beach Memorial in Long Beach, California. His HMO only allowed him to remain the hospital for 26 days. Unimpressed with the outpatient rehabilitation that he was offered through his health plan, Casey did exhaustive research to find a private therapist to work with him. He knew how important it was to get the right kind of therapy. He had been studying physical therapy, kinesiology, and physiology at California State University in Long Beach. “Based on my own knowledge and the expertise of this physical therapist, I just started working out on my own,” Casey explained. This determined personal trainer continued to train his clients. How could they say “No” to doing their workouts when they saw him train so hard, despite his partial paralysis? He went back to school in January. A month later, he was able to get rid of his cane and walk without any assistance. Casey walks with a limp – the result of the surgery, which left him with a 3/4-inch leg length discrepancy. Casey continued to focus on his rehabilitation. Ten months after his accident, he was doing 200-lb leg presses on the weight machine and spending 45-60 minutes on the Stairmaster. By 1996, he was fit enough to walk down the aisle and marry Lisa. By 1999, Casey attempted his first triathlon, the Long Beach sprint triathlon. It took him an hour and seven minutes to do the half-mile swim. He did not make the cut off to complete the race. He did not give up. He trained a lot harder and smarter. He figured out the crux of the problem with his swim stroke. The partial paralysis made it difficult to get his hand at the right angle to pull the water. He discovered that a small swim paddle strapped to his right arm helped correct the issue. The following year, he entered the same triathlon and finished the entire race in an hour and thirty-six minutes. 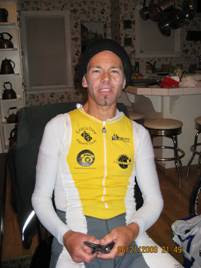 He entered Ironman C’oeur d’Alene in Idaho, a race that would include a 2.4-mile swim, 112-mile bike, and 26.2-mile run on June 21, 2009. Though he trained a year for the event, Casey really cranked up the mileage in January. His friend, Scott Spence, helped him put together a meticulous training plan. Casey’s longest training ride on the bike was 122 miles. His longest brick was a 112-miles on the bike followed by a 90-minute run. He completed a 2.4-mile swim open-water swim. He had done everything right to prepare for this event. On the morning of the race, there was a mass start of 2,600 people in the water at once. Casey was the only physically challenged athlete in the water that day. He was given an orange cap to wear which was hard to discern from all the red caps worn by the able-bodied men on in the water. Casey had been in crowded race starts before. He wasn’t prepared for the difference in buoyancy between salt water and fresh water. He wasn’t expecting the violent chop from the 15-20 mph winds that hit him on his weak side. He completed the first lap in 1:01. He had plenty of time to make the cut-off for the swim in 2:20. Casey walked up the shoot of the race corral, where was greeted by an official. The woman said, “You know you only did one lap.” He calmly replied, “Yes, I know.” “You’re disqualified,” she stated. Maybe so, but Casey wasn’t finished. At first, he was so devastated by what happened that he collapsed on the ground. He grabbed his gear and his bike out of the transition area. And then he improvised and created his own Ironman course away from the other competitors, so he wouldn’t interfere with the race in any way. He rode 112 miles on the bike. He went back to the house he rented and changed into his sneakers. His friends and clients kept calling and texting throughout the night to tell him he was already an Ironman for doing what he did. At 10:35 p.m. he made it unofficially official by completing a full marathon. When he arrived home, the kids were asleep and he felt like he might fall over from exhaustion. He knew if the conditions had been different, he would have completed the race that day. Next year, Casey will return to Coeur d’Alene to compete in the Ironman again. Cause that’s what he does – he gets up, and he plays. NOTE: If you have a good comeback story, please contact me at sixtwothreetries@gmail.com. I’d like to interview you. I hope this will be one of many Comeback Kid stories. Here’s why.